How Much of Kim and Trump Can an Investment Portfolio Bear? Rising corporate profits and the strongest global economic upturn for 20 years: Only Kim and Trump can throw a wrench into the works. They provided plenty to talk about at the 2017 Credit Suisse Financial Forum in Davos. What are Kim Jong-un and North Korea unleashing? What can or must be expected from Donald Trump? The resolute rise of China is leading to increased polarization in Asia and the Pacific Basin, and to a new world order. For André Helfenstein, Head of Institutional Clients at Swiss Universal Bank, "the decisive factor is how and in what areas the two superpowers will work together in the future." What is clear is that, against such a global political background, the challenges in the investment business, and hence for the Swiss pension system, will be further accentuated. "Although confidence about the economic outlook continues to bolster investment markets," André Helfenstein continues, "it's worth looking in more depth at the strengths and weaknesses of portfolio construction methods." The unpredictability of US policy, the tensions on the Korean peninsula, and the disagreements within the WTO could cause the engine to falter at any time. However, it would be wrong to be guided by fear and negativity. Burkhard Varnholt, Chief Investment Officer at Swiss Universal Bank, takes his lead from Credit Suisse Ambassador, Roger Federer: All of the top 100 players in the world are at a similar level. It's just that Federer makes fewer errors than the others! "You must also apply this to yourselves," Varnholt told the large number of pension fund experts who attended the forum in Davos. He drove it home in no uncertain terms: "The economy is booming on every continent, interest rates are and will remain low in the long term, and corporate profits are on the rise. For just over a year, we've been seeing the strongest global economic upturn in the last 20 years." Yet pension funds are still holding ten percentage points less in equities than in 2008. Worse still, "investors are prepared to pay a huge amount for so-called safe, nominally return-free investments." The investment professional does the math: "A bond with a 0.5 percent return corresponds to a price/earnings ratio of 200. This disproportionately high rating for safe investments illustrates the "wall of skepticism," which describes the mentality of many investors – almost like an after-effect of the trauma of the 2008 crisis. It is indicative that the equities of a certain company have a price/earnings ratio of 16 and also pay a high dividend of 5 percent, while the same company’s bonds have a price/earnings ratio of 200." As a current example, he mentioned the recent issue of a bond with 0.3 percent return which was oversubscribed sixfold, despite the fact that a single dividend yields more than the interest on the bond over a ten-year period. Varnholt added, "In retrospect, what at the time seemed highly uncertain is now clear: The pension funds should have increased their equity holdings in 2009, rather than reducing them." Despite the current boom, it is worth looking at the two strongest economic powerhouses, the US and China. Professor Zheng Han from Tongji University in Shanghai certainly sees economic challenges in his home country. For example corporate indebtedness has reached an alarming level, a serious real estate bubble is threatening to burst, and the one-child policy is leading to a decline in population, in turn leading to falling private consumption. However, he is far more concerned by the situation with North Korea, which he sees as a "ticking time bomb." The government would be well advised to avoid letting the conflict escalate lightly, otherwise all the work put into developing the economy would have been for nothing. In the US too, the economy has been on a growth trajectory since mid-2009, when the recession triggered by the financial crisis came to an end. The unpredictable President Donald Trump is giving rise to fear and concern as, almost daily, he announces or reverses sanctions and boycotts via Twitter, and then calls for them again. "People who thought Trump would develop presidential stature have been disappointed," Walter Niederberger, US economics correspondent of the Tages-Anzeiger newspaper, concludes. "The question today is rather whether he can even complete his term in office. It is hard to believe that the US and the world can survive 40 more months of Trump." According to Niederberger, many political experts anticipate that he will resign early – as Nixon did – in order to save himself the humiliation of a possible criminal trial in connection with Russia's involvement in the elections. To date, the stock markets have reacted with surprising calm to the standoff between Kim and Trump. "The markets are expecting a war of gestures rather than a war of weapons," says Burkhard Varnholt. "Hopefully they will turn out to be right." Investors rarely perceive Asia to be a risk region, says the investment professional. "But Asia is a continent of frozen conflicts. Many rivalries were suppressed by globalization." For more than ten years, the Financial Forum has been aimed at the top management and decision-makers of pension funds, insurance companies, health insurers, and major corporate clients. The main focus is on discussing investment topics; representatives of academia and business contribute political and economic viewpoints. 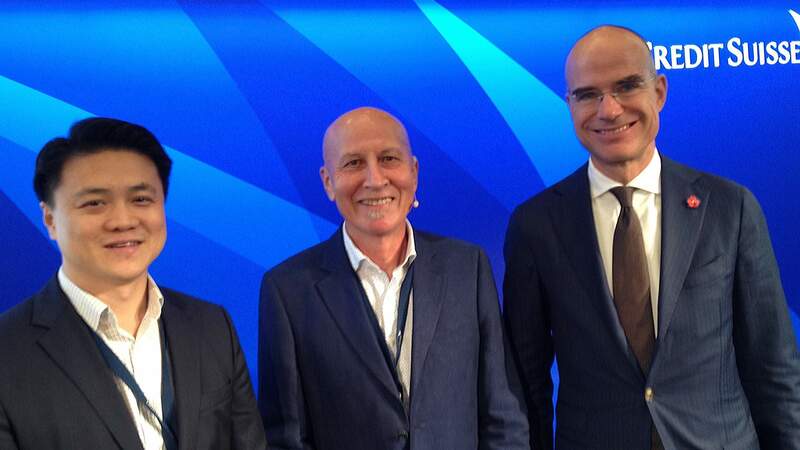 The host, André Helfenstein, Head of Institutional Clients, and Beat Zeller and Jürg Roth from CS Pension Funds & Corporate Investors, appreciate Davos as a venue because it creates a distance from day-to-day business and provides space for sharing ideas. Is active How Much of Kim and Trump Can an Investment Portfolio Bear?